A number of loons summer on Upper Saranac Lake. Loons, with their striking looks and haunting calls are a signature species of the Adirondacks, evoking images of a wilderness setting. Pairs build nests hidden in grasses right on the shoreline, incubate their eggs for a month and raise their young. Issue: When disturbed, the loons signal their distress by steadily swimming away, flapping their wings, or calling in a loud wail. Harassment may cause adults to abandon the nest, leaving the eggs accessible to predators. Loons, and especially young loons, have limited capacity to repeatedly dive below the surface to avoid disturbances and boating harassment. 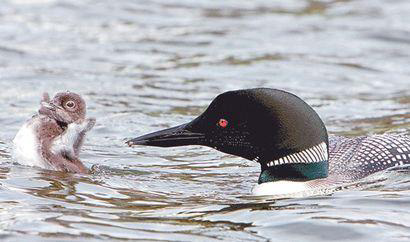 Loons nesting and raising their young are increasingly threatened by mercury contamination caused by coal burned at power plants and industrial facilities from the Midwest. Prevailing winds carry the mercury-laden smokestack emissions to this region. Loons are highly susceptible to mercury buildup which causes them to become lethargic, negatively impacting reproduction and defensive behaviors. Keep watercraft wake to a minimum near shore. Give loons their space and go no closer than 500 feet from known loon nests. Dispose of used or snarled fishing line responsibly. If you spot any discarded monofilament fishing line please help by removing it and properly dispose it. n addition to NYS Environmental Conservation Law violations, intentional harassment of loons is illegal under the U.S. Migratory Bird Treaty Act.